They have a tough time on our coast Ringed Plovers these days; too much disturbance in what few nesting territories are left, tidal surges wiping broods out etc etc, so it was a pleasant surprise to come across a family party skittering around one of our car parks early this morning, the adult birds’ strident distraction calls trying to deflect from the obvious position of their offspring. 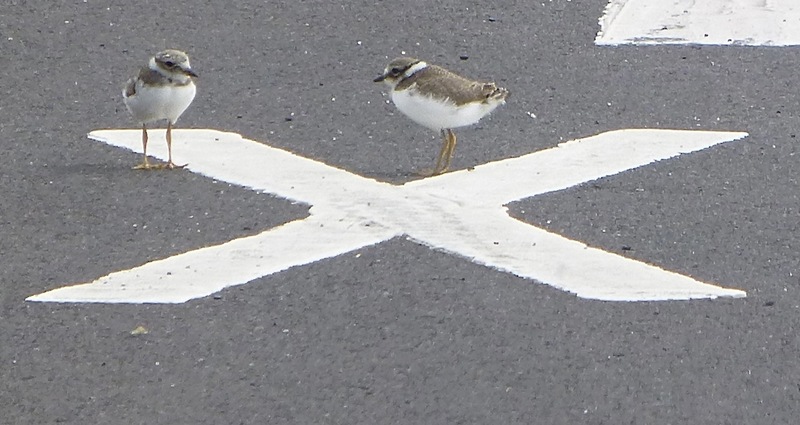 Standing in the middle of a car park as vehicles began to arrive was hardly the best survival strategy and the “ringed” Ringed Plover (sorry) parents quickly got the three youngsters back onto slightly safer ground nearer the nest site. Where are they you say? Best leave ’em in peace I say. But X marks the spot. 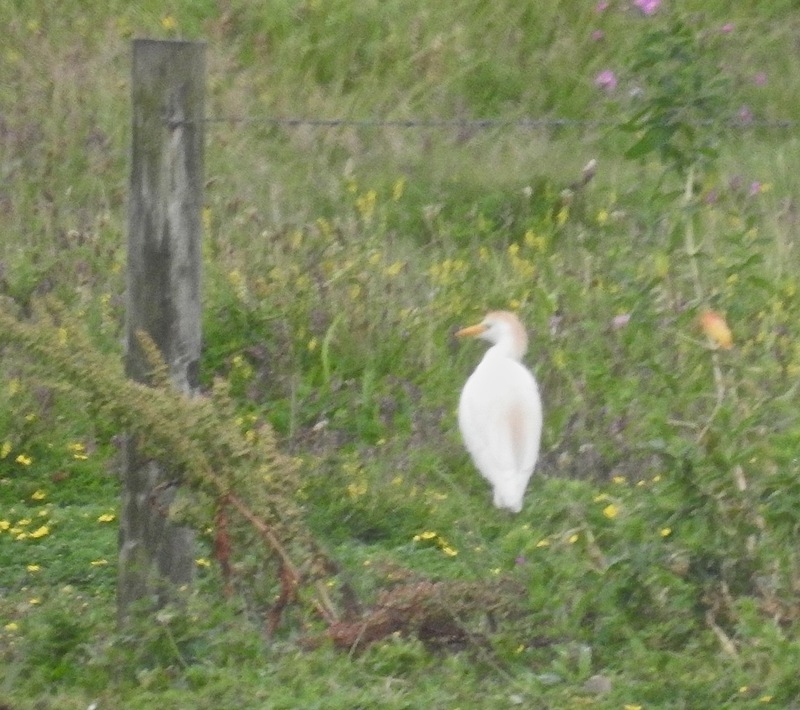 Deep gratitude to the RSPB’s Alex Piggott for her text this morning explaining that yesterday’s Cattle Egret was still at Marshside and on Rainford’s Lagoon, although it presented me with something of a wardrobe dilemma. 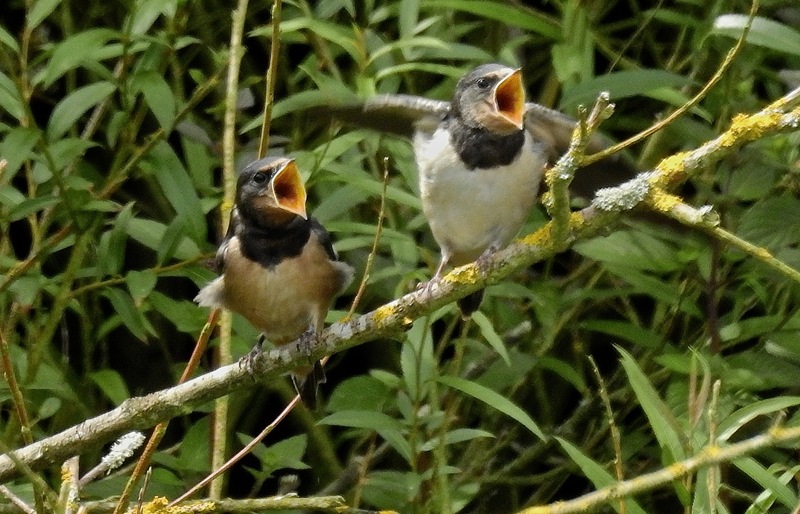 I appeared to have mislaid my birding pantaloons and the clock was ticking – Mrs D (the master of Dempsey Towers) is currently en vacance with the outlaws in France, and a chap can’t be expected to memorise where everything is in the house. Think, think, what would Beau Brummell do??? Luckily I remembered I’d bought a great big waterproof poncho at the birdfair last year for duties in more exotic climes, and as a short*rse it comes right down to my ankles – problem solved, lash on a pair of bilstons and sandals and no-one will be any the wiser – after all no polite person ever asks a Scotsman what’s under his kilt right? 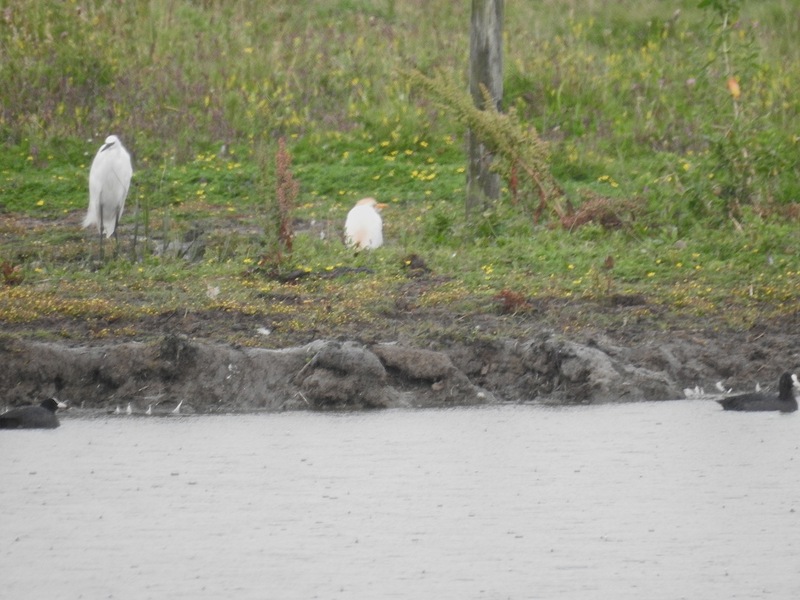 Whizzed up to Marshside in the rain and the little white chicken was still hunched up at the back of the lagoon with a Little Egret for company, looking as miserable as only a Cattle Egret can in bad weather. Now many readers of the blog around the globe may be perplexed at this juncture as to what the fuss was, but north west England remains one of the few outposts where Cattle Egret is not omnipresent (not counting all points further to the north of course), and this one had plenty of colour on the crown and back, although you’d be hard pressed to see this in the rainsodden pix I took just before the showers shut down my P900. 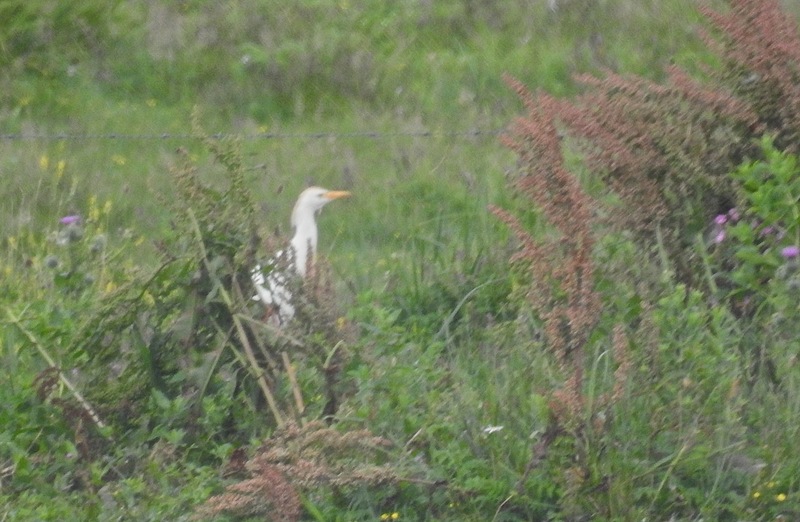 After a minute or two the egret went for a wander in the rain into lusher vegetation behind the lagoon. With only a handful of records before I think it maybe a Marshside tick for me too, which more than justifies the “poncho only” approach to year listing. I was just profoundly grateful that it wasn’t too windy. 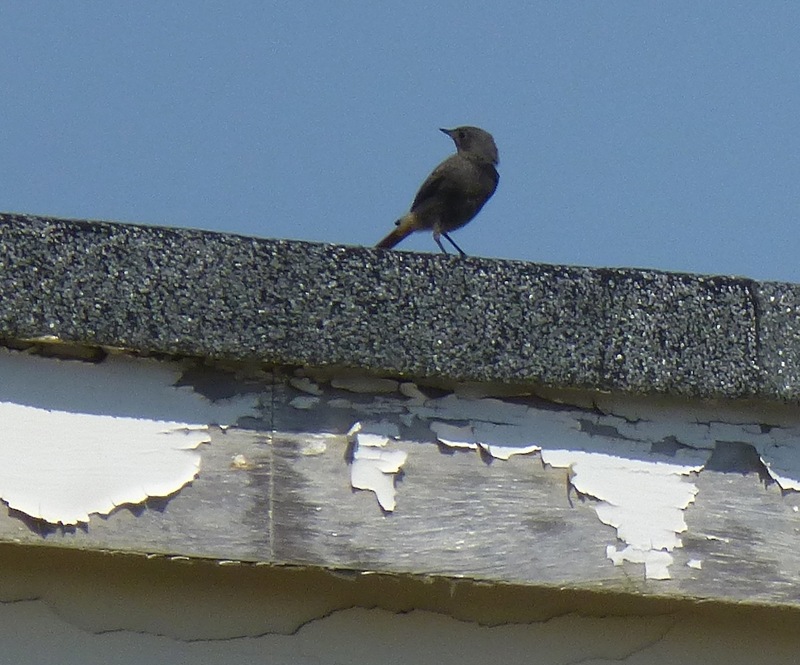 It’s pretty much the same every year – a flash of orange and there’s a fine young Black Redstart quivering on the office drainpipe banishing the summer doldrums and prompting the usual intriguing question – just where do you come from? 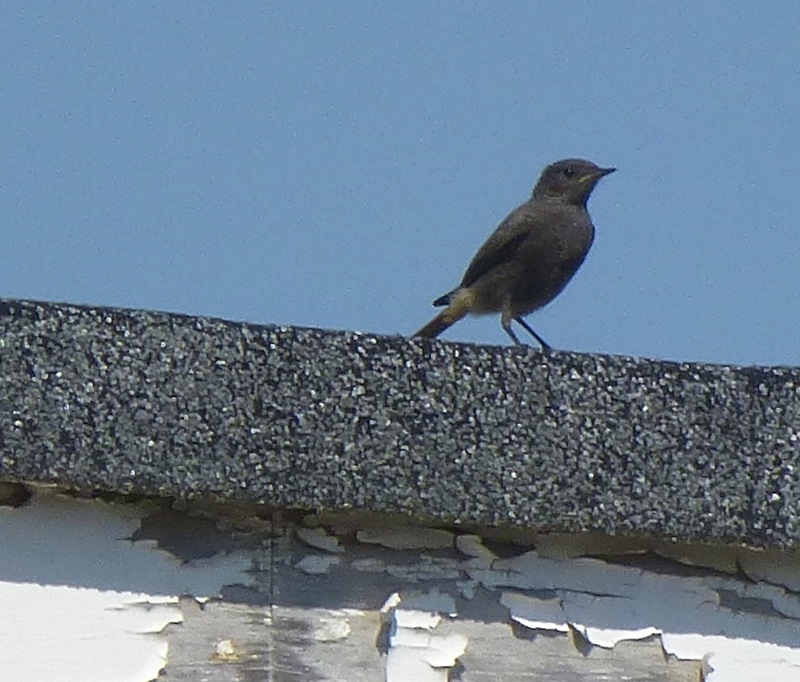 This afternoon’s individual was no different – a lovely gape still clearly visible (apologies for the point and press crappy shots, it was hot, and I was excited) as it flitted around the Ainsdale Discovery Centre at 4pm before tantalisingly zipping back over the big fence and into the Pontins gulag from whence it came. Young (very) male I think. First sign of them all year – I haven’t heard a squeak of song or had even a peripheral glimpse of one on the fences and rooftops, and I do look. Youngsters do disperse of course, so it could just have come from somewhere else. Time for a chat with Mr Pontin to see if any guests have noticed little birds with orange tails (I won’t mention the gulag bit). Good to finally stop watching the summer paint dry. 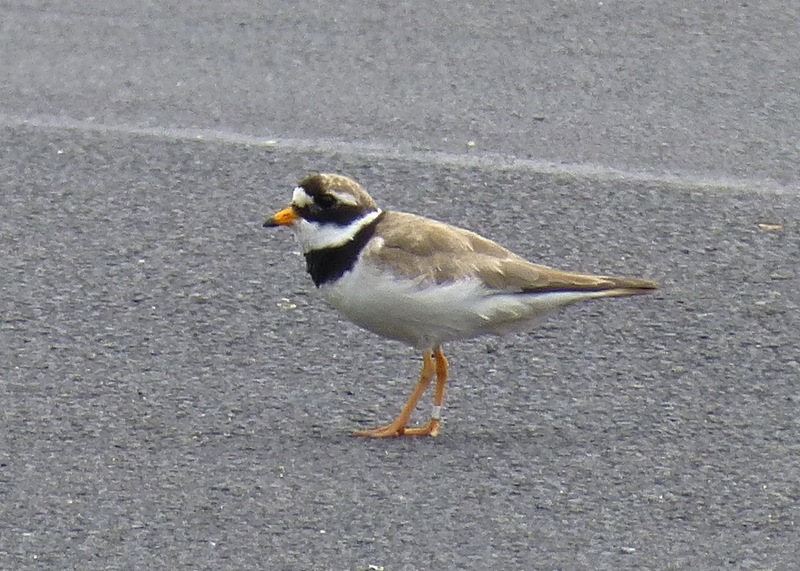 A few hours at Lunt Meadows on Sunday was all very young birds and Black Tailed Skimmers, although Little Ringed Plovers, Common Sands and Dunlins offered light at the end of the summer tunnel. 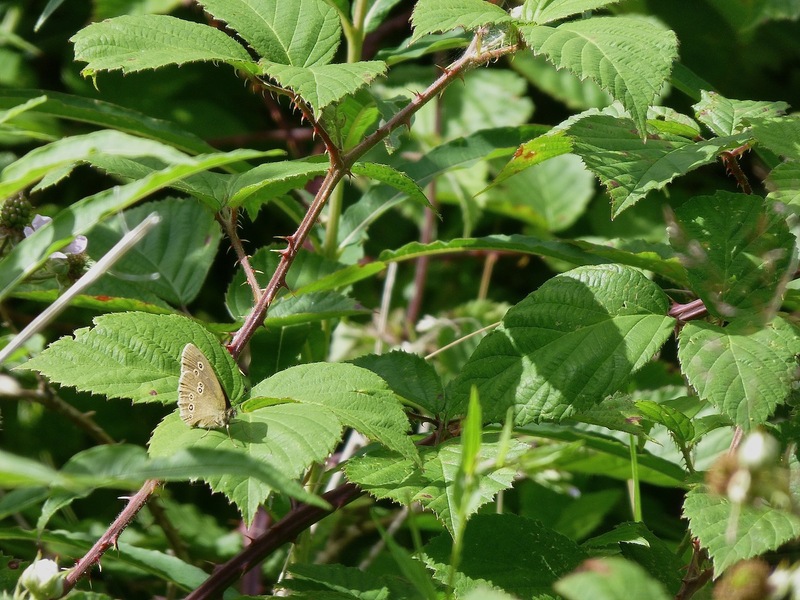 I finally got round to having a look at the Ringlet butterflies on Ainsdale National Nature Reserve today – three of the beasts were tottering about a favoured area of bramble, two very worn, one fresh as a daisy. Andrew Spottiswood has been reporting them there since June 22nd this year, and I really should have popped down sooner to see what appears to be a new butterfly species for the coast (yup, it’s still summer). 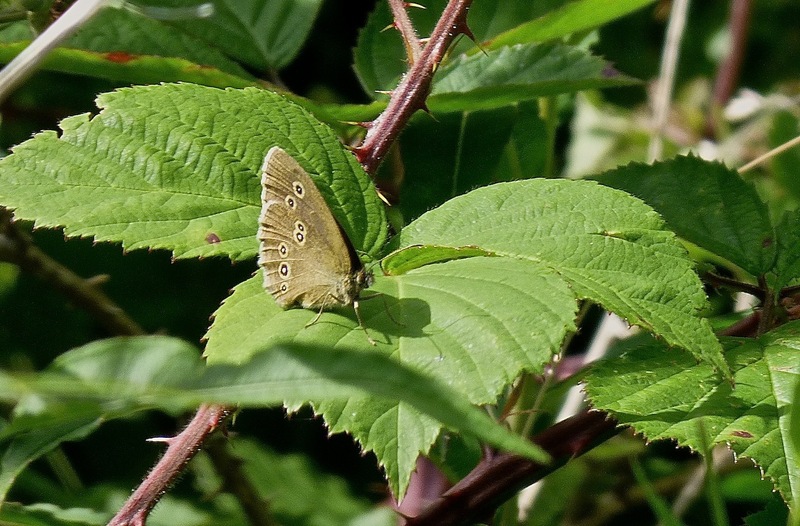 There have been records from Southport in the past, but this year’s arrival appears to be something more substantial, with Ringlets being seen at a number of locations on the NNR, and being recorded at other new sites for the species in the north west. 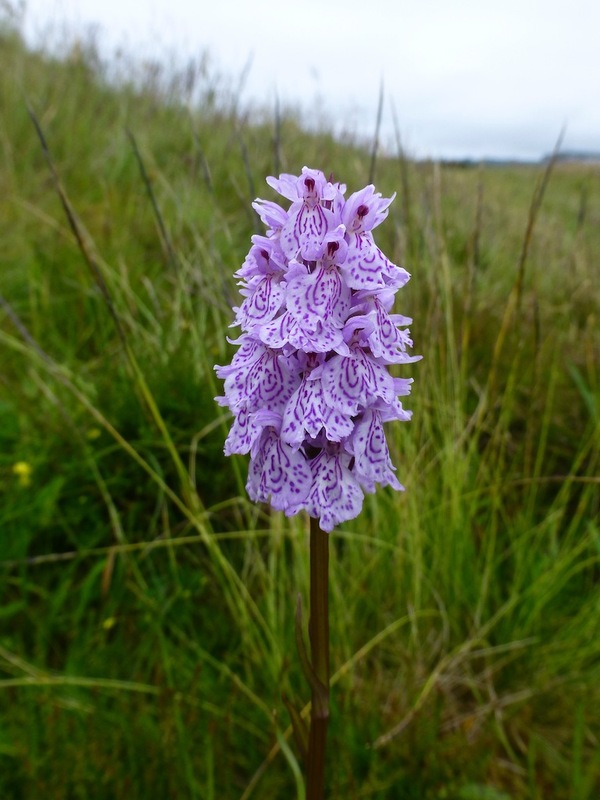 Thanks to Andrew for alerting me to them, and to Pete Gahan of Natural England who patiently described one of the areas they’ve been turning up in so I could indulge in a butterfly twitch. While they have been seen at a number of locations, they seem to be easiest in the first firebreak on the right as you walk down the Woodland Path from Ainsdale to Freshfield (the hard surfaced track that runs parallel to the railway line). This is about 200m down the Woodland Path past Pinfold Pond and Meadow, which is also stonking for butterflies and moths. Go through the open metal gate at the start of the firebreak and immediately on your right there is an area of brambles, running for about 50m. The Ringlets are hanging out there, perching on bramble leaves along with exquisite Small Coppers, Meadow Browns, Gatekeepers, lovely big Dark Green Frits and Small Skippers. Don’t be a dork and walk into the brambles though – you’ll just disturb the butterflies and other insects and young Robins and Wrens there. The Ringlets land close by the path fairly frequently, as do the other butterfly species. 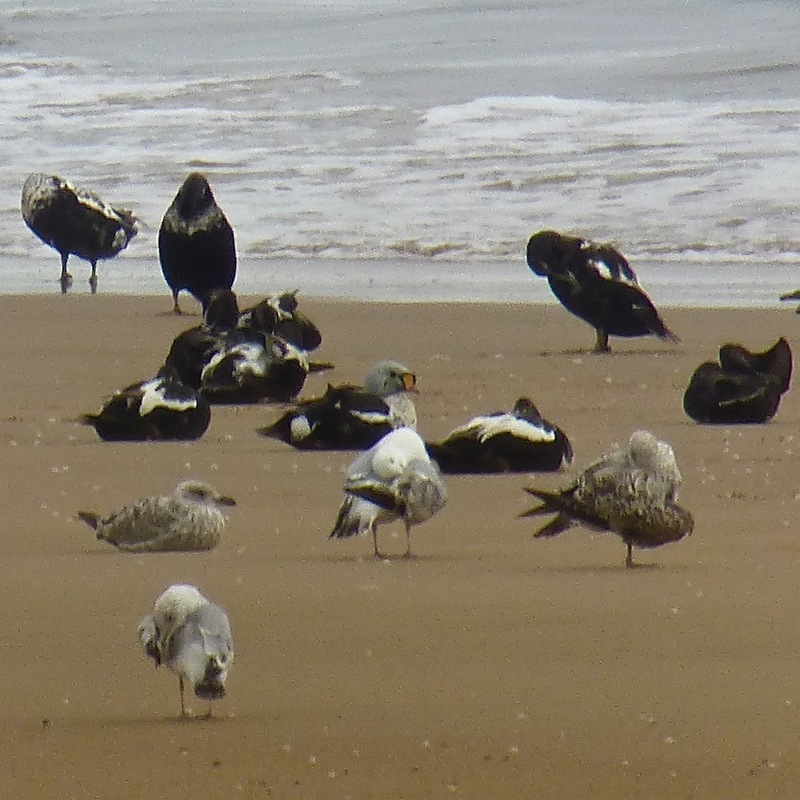 The Black Dog sands at dawn were the backdrop for the usual assortment of hangovers and painkillers inevitable for a Saturday morning twitch. I’d picked up Trops, Neill and Pete (thanks fellas, as ever it was a blast) and driven north through a night of never-ending rain to try for the American White Winged Scoter, which has been amongst the Common And Velvet Scoters here for its second summer vacation. 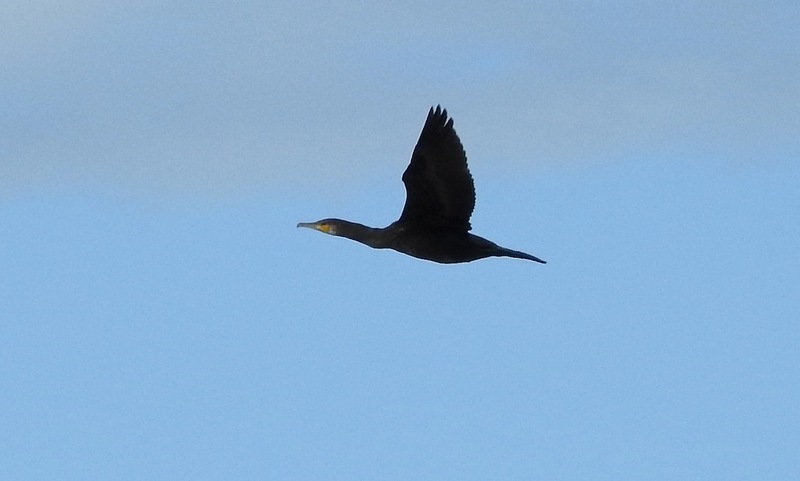 The bird was hanging out with a group of about 20 Velvets within the wider flock, and although it was some way offshore, you could see all the big ski-slope billed, Mr Spock eye-browed splendour of this Yankee well enough with ‘scopes on full zoom (and phasers on stun). 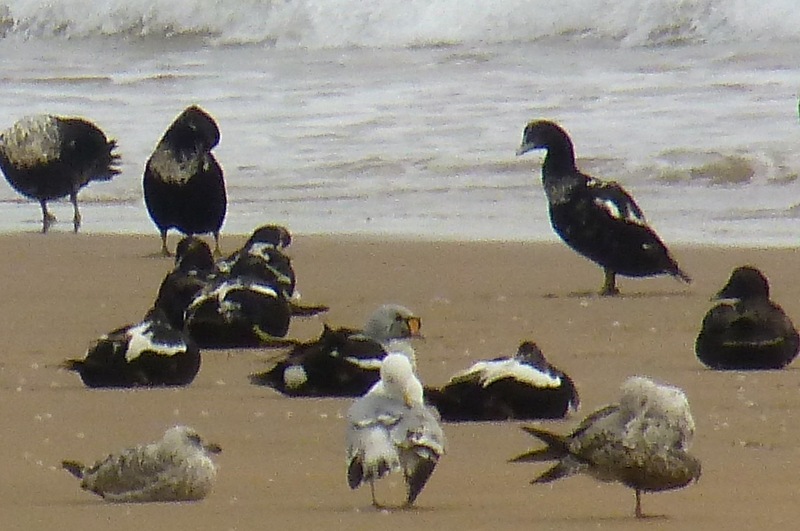 Despite being a big bird – clearly bulkier than Common Scoters and the Velvets too, it had a disconcerting ability to melt away into the scoter horde. 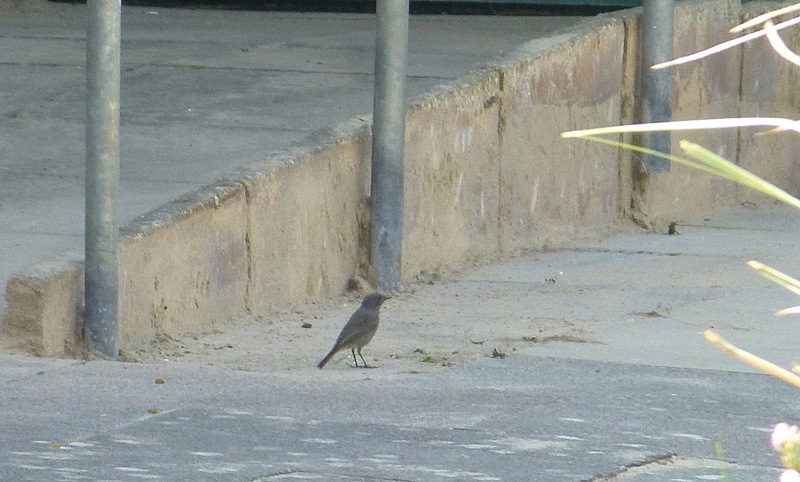 Too far away for me to get a picture – if you don’t believe me look at this, you can just make out the head shape and upturned eye crescent if you squint really hard, but you’ll have to take my word for its white wing flashes, blotchy brown underparts, pale eye and pinkish bill. Far better to look at the lovely shots by Kris Gibb on Rare Bird Alert’s galleries here and here …there, isn’t that a stonker when you can see it properly??!!? 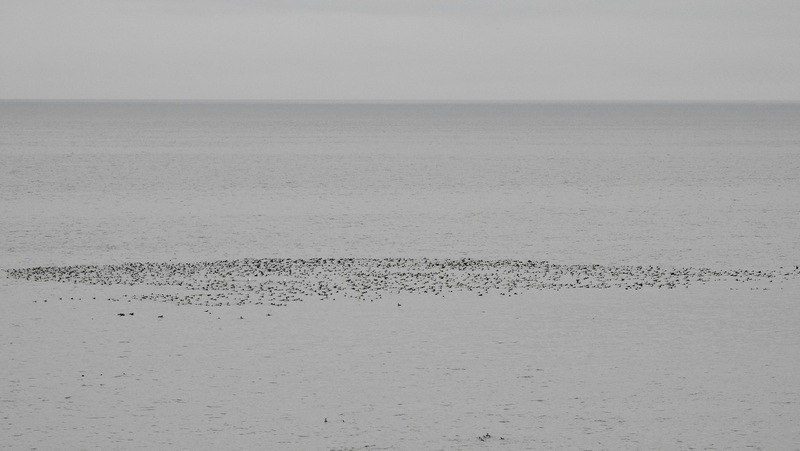 It made a pleasant change to watch sea ducks on relatively flat calm water, with squadrons of Red Breasted Mergs and Eider here too, Gannet, Fulmar, two Arctic Skuas, Kittiwakes, Guillemots and Red Throated Divers. A short distance up the coast, once we’d waded through the rain saturated dune vegetation of the golf links, we enjoyed views of a male King Eider, hanging out with its commoner congeners before an early a.m. jogger decided the best thing to do was flush everything onto the water. The business end of the day was completed by 9am, before the long haul south through the rain again. 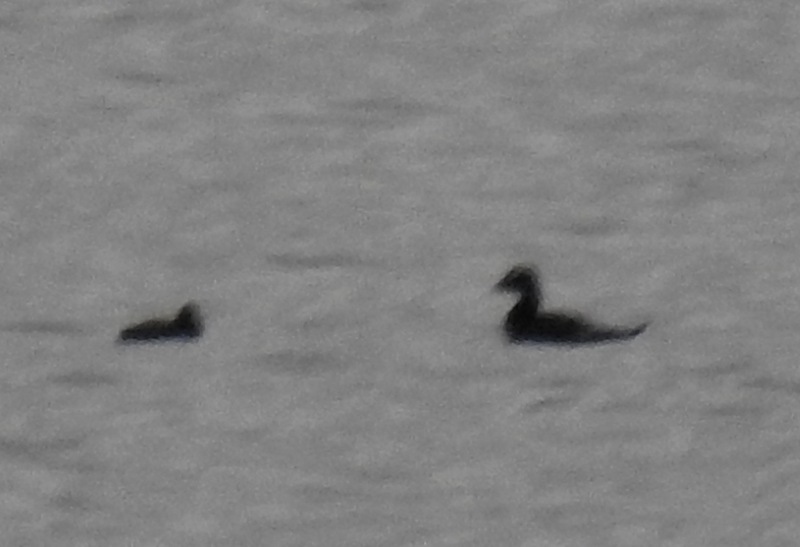 What I wouldn’t give for scoters this close at Ainsdale. 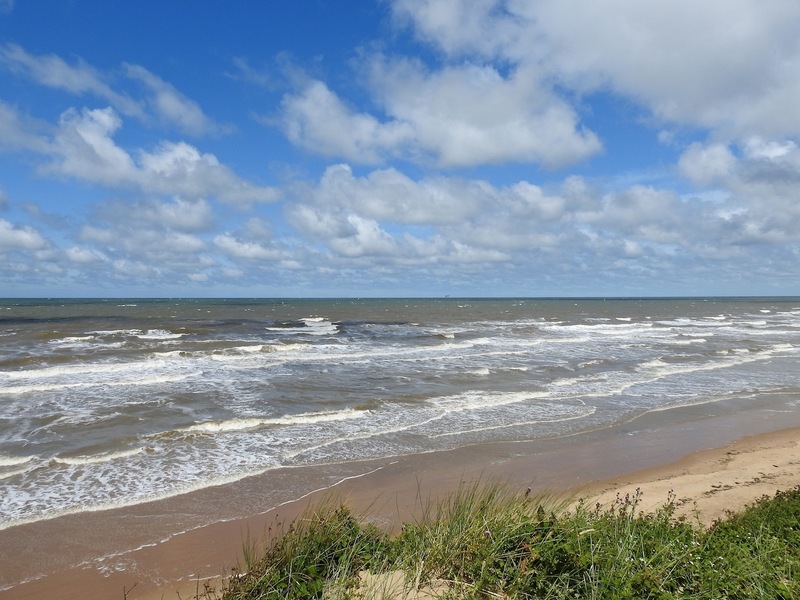 You never know what you’re gonna get with a seawatch at Formby Point – a good force 4-5 westerly that had been blowing all night and a fine high tide just after midday lured Bazzo and I back down there today and we got…just about nowt. One intriguing shape briefly out on the horizon, that didn’t stick around long enough to i.d. and about 100 Gannets were the best of it. 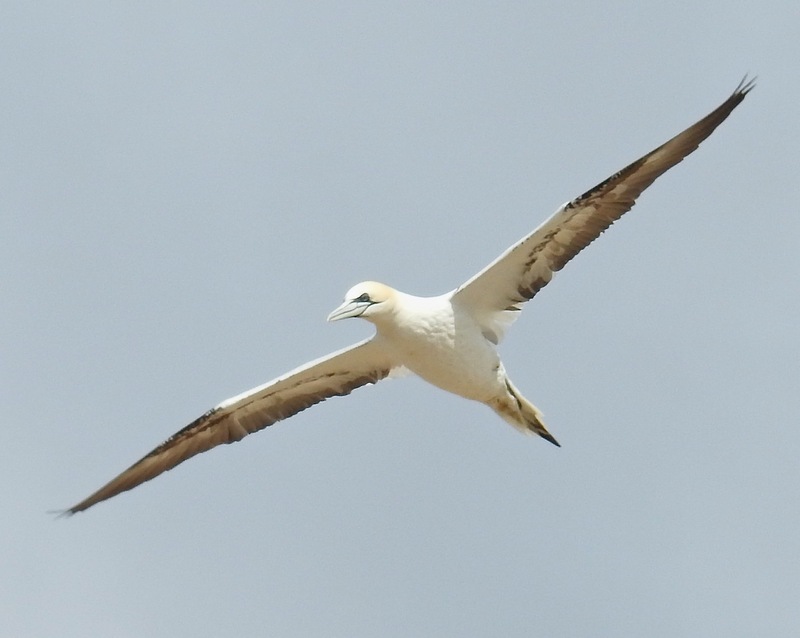 Just as we were packing up, a sub-adult Gannet came in right over the dune ridge, where Dark Green Fritillary was clinging to the wind-whipped thistles, an exciting moment on an otherwise quiet morning. I wasn’t looking – is that paint dry yet?? Actually, that’s unfair, it wasn’t that bad, just that the wind had dropped a fair bit and at best gusted to a westerly f3-4, when Bazzo and I got down to the Tobacco Dump for a seawatch this morning. High points were a pristine adult summer Med Gull south at 1020, and two Arctic Terns wafting along in the same direction across the bay over the tide. 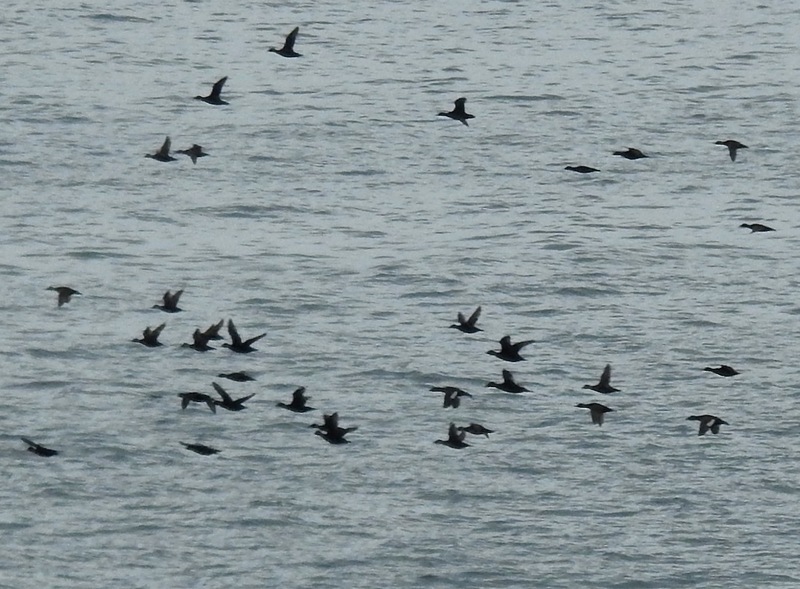 Common Scoter numbers continue to build and respectable numbers of Manxies were passing, although most were out at horizon distance, playing peek-a-boo in the wibbly wobbly. 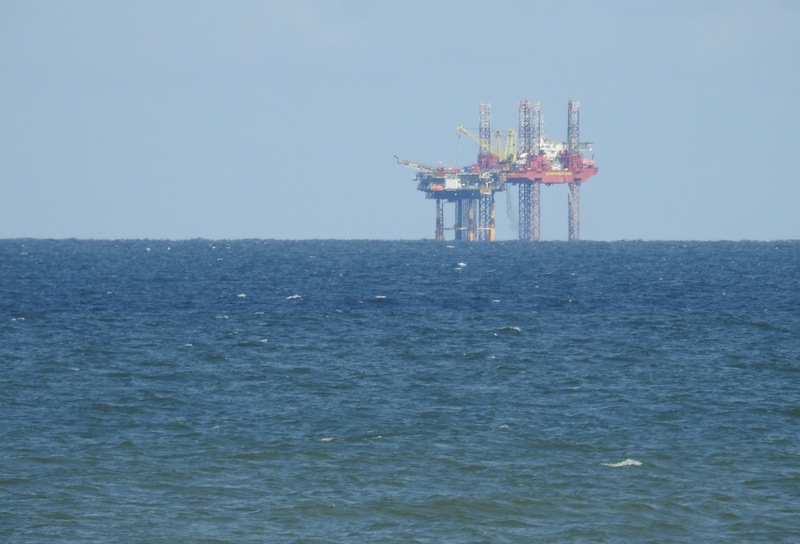 Admittedly not the most thrilling session, but pleasant enough, plus it’s more hours deposited in the seawatching kharma bank….and the company was good too. 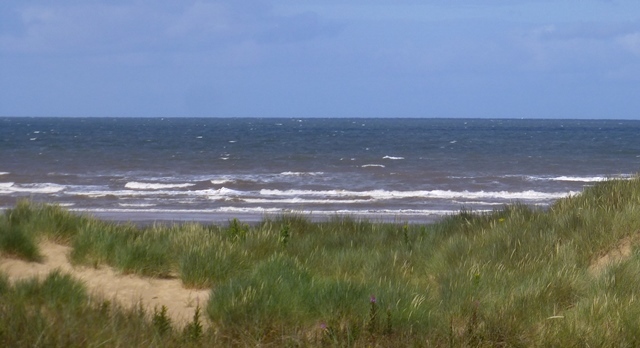 A tidy west south westerly and a rising tide at Ainsdale this morning, so it was worth scanning the waves before work. Gannets strung along the wibbly wobbly sea/skyline, ever-present, but impossible to say how many, as some pass and some wheel back again to feed. 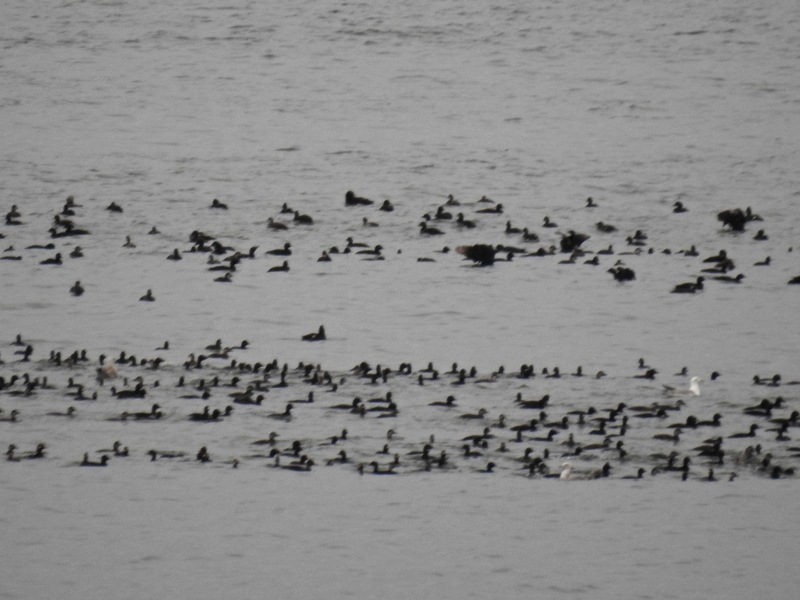 As the morning wore on, more and more returning groups of Common Scoter, some parties including as many as 70 black puddings, were pitching into the swell, looking like they’d just arrived back from breeding grounds (numbers tend to pick up again at Ainsdale from July onwards). 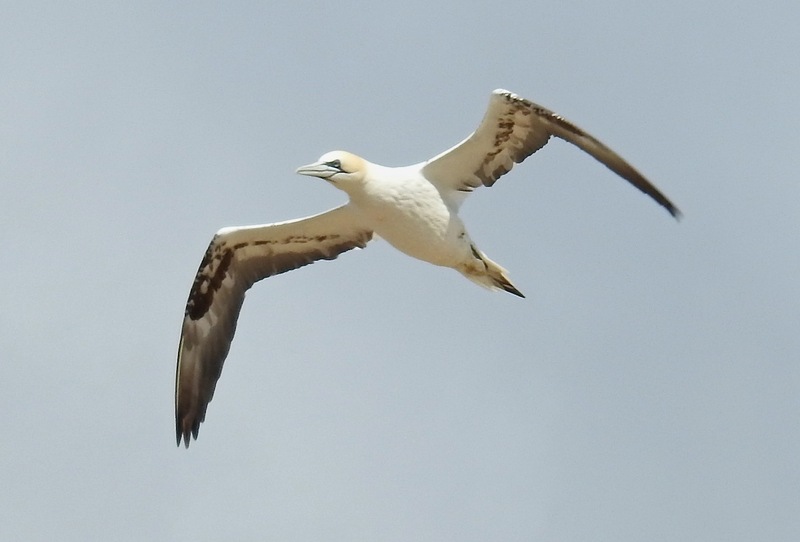 Feel the admiration and jealousy when you watch Gannets and Manx Shearwaters sailing past on the wind – I can never get bored with the fluid motion as they pass. They have a hard life of course (you try flapping your arms all the way to Tristan da Cunha and back), but there’s not many things as effortlessly cool as a Manxie shearing by on the edge of the wind. What life lessons could be learnt if seawatching was on the National Curriculum? Perhaps vomiting as a defence mechanism and a constant diet of fish, plankton and chum aren’t the best examples for developing minds, but I think you get my drift. After all, these babies don’t do borders. What appeared to be 4 Whimbrel went south at 0845, but they were a long way off, and it seems a tad early for them still. And besides, staring at the largely empty waves and heat shimmer is infinitely preferable to witnessing the breathtakingly bone-headed arsery that’s unfolding on dry land behind me at the moment.